Surprisingly, the first few years after the "run," there was very little acknowledgement of the anniversary of the historic day, September 16, 1893. On the first anniversary of the opening of the Cherokee Strip the ladies of the St. Mark's Episcopal church used the occasion of the "bornin of the strip" to provide entertainment consisting of music, recitations, addresses and refreshments to help liquidate the debt incurred by the church. The following year the Guild hosted a picnic in Graham's park. A few Perry citizens went to White Rock where the townspeople provided an assortment of festivities including an old settlers' reunion, broom drill by thirteen young ladies, barbeque dinner, races, ball games, various speakers and a grand ball in the evening. In 1899 the Noble County Sentinel reports a "Grand Celebration" at Cooper's Grove, 6 miles west of Perry. The program consisted of music, orations and speeches, a 200 yard race for claims on foot, bicycle race, horse race, dinner and a platform for dancing for those who "wished to trip the light fantastic toe." Two other celebrations took precedence over the anniversary of the opening of the Cherokee Strip at the turn of the century. The city celebrated an old fashioned Fourth of July in 1900 with many attractions and in September the citizens of Noble County partnered with the Trotting Association to host the first annual Noble County Fair and Races with $6,000 in purses. The Perry Republican of September 5, 1902 says, "It is now determined that the Perry band and the Perry crowd will go to Billings on the big Sixteenth." The 10th Anniversary of the opening of the Cherokee Strip brought life to the celebration. The following lists a portion of the program planned for the great Carnival to be held September 15 - 17, 1903. Southwestern Target Handicap Shoot, Flower Parade, Band Concerts, Old Settlers' Reunion, Horse Races, Games, Firemen's Exhibition and Street Shows: Ferris Wheel, Miniature Railway, Funny Fat Man on Clothesline, Cycle Wheel, Laughing Parlor, Merry-go-Round and Vaudeville shows. 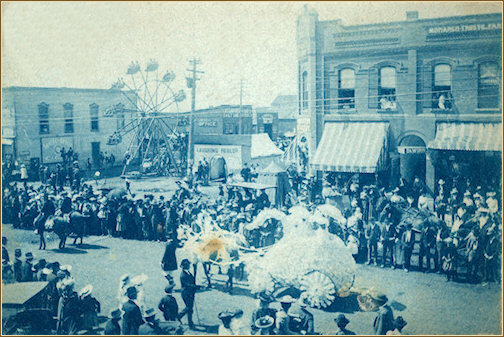 At first glance this photograph appears to be taken at the 1903, 10th Anniversary Celebration with three of the key attractions visible: the Ferris wheel, laughing parlor and a decorated carriage from the flower parade. However, on closer observation we note that the building on the left did not exist in 1903. By 1903 the Hainer building was on this corner. This early picture appears to have been taken before the 10th Anniversary Celebration and presents us with a modern day mystery as to the occasion. In the estimation of the Perry Republican the flower parade at the 10th Anniversary Celebration was the very best feature of the entire celebration. "Had the Republican been the judge of the parade it would have given to every flower float a first prize." The ladies of the city were responsible for the flower parade and its success. For their efforts a souvenir book of the 1903 parade was published with photographs of each float taken by photographer Hughes. Were real flowers used on the floats? On close inspection of the photographs some real flowers and leaves appear to be used on the parade entries. However, the floats were not decorated solely with flowers and live plant material. The September 16, 1953, 60th Anniversary edition of the Perry Daily Journal contains a historic picture of Mrs. W. G. Long and her sister sitting in a prize winning carriage of the Flower Parade. She describes the flowers on their "road wagon" as handmade yellow roses. Was the first flower parade at the 10th Anniversary Celebration? No. The July 4th, 1900 celebration also mentions a Calithumpian (noisy parade) including Rag Muffin, Trade Display and buggies and carriages decorated with flowers. By 1911 the Perry Republican featured the following article titled "Celebration Flower Parade." "The most beautiful feature of our annual strip opening celebration is the flower parade, and it is with more than a little pleasure that we can announce the exhibit for this year will eclipse all former efforts. The Committee in charge of the event reports that the ladies are taking the matter up with unusual enthusiasm and that there will be more carriages and of undoubtedly more beautiful design than last year when the display was the cynosure of all eyes and a most agreeable surprise to our visitors. The ladies horseback display will be an added feature to the parade this fall which promises to add much to the occasion. Mesdames Nicholson and Benight are in charge of the display and would like to hear from every lady in the city as to taking part in the carriage, automobile or horseback decorations"
Over the years the anniversary of the opening of the Cherokee Strip and the Noble County Fair have been combined into a week of celebration each September. Most of the celebrations included a carnival. The picture to the left shows one of the 1909 carnival attractions. The festivities culminate with a parade where thousands of visitors flank the streets of the town square to pay homage to our early day settlers. Please visit our Parades and Carnivals link to view some the beautifully festooned carriages, horses and autos and our Old Settlers' Reunion link to join in the celebration of the town's grandiose beginning on September 16, 1893.